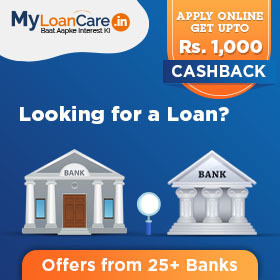 MyLoanCare Ventures Pvt Ltd., or the website https://myloancare.in/ (together called the "Company") is not a lender and does not provide loans on its own. Information carried at website is not and should not be construed as an offer or solicitation or invitation to borrow or lend. By submitting your query, you authorize MyLoanCare to share your information with lender(s) and consent for such lender(s) to pull your credit information report and call/ message you regarding your query. The outcome of your query or application is solely a matter between you and the lender(s).